The HI-E DRY 195 high efficiency dehumidifier is designed and built with emphasis on efficiency and durability. The HI-E DRY 195 removes 5.4 pints of water per kilowatt hour at 80°F and 60% RH, while the industry average remains at only two to three pints. The high-efficiency design of the HI-E DRY 195 offers more than just dramatically reduced utility costs. The larger water removal capacity from a smaller, more efficient refrigeration system eliminates the need for 220 volt circuits in many applications. 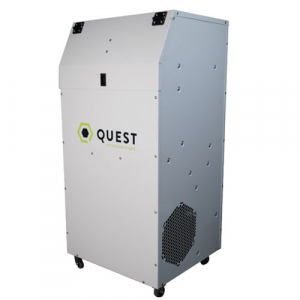 The smaller refrigeration system allows the HI-E DRY 120 to cost less than other commercial dehumidifiers of equal capacity. The HI-E DRY Model 195 features a dehumidistat controller with settings from 20 to 80 percent relative humidity and a positive "on" and "off" setting. The unit is portable and has four casters. The internal condensate pump is capable of lifting condensate 17 feet, and 20 feet of condensate hose is included. The unit's 6 ft. power cord that plugs into a 115 volt receptacle with ground. Controlled by a dehumidistat with settings from 20 to 80 percent relative humidity and a positive "on" and "off" setting. Contains a blower switch that permits continuous blower operation independent of dehumidification. Portable and provided with four casters. Contains an internal condensate pump capable of lifting condensate 20 feet. 20 feet of condensate hose. Factory installed six foot power cord, 115 volt with ground. 2" MERV 11 Filter (16x20x2) keeps air clean and keeps the unit running at peak performance. NTSUPPLY.com is one of the largest Thermastor Dealers in the United States. We stock the entire Santa Fe family of products and accessories in our own facility providing you with a quicker turnaround time and instant tracking information on your order. We have installed hundreds of units in all types of applications and can offer expert advice on how to properly install yours. We are also an authorized service center for Thermastor products and can offer warranty service and replacement parts. If you are looking for the best possible dehumidifier and a company who can stand behind it, Thermastor and NTSUPPLY.com is the clear choice.